We are celebrating TWENTY YEARS!!! And we want you to join us! We are posting weekly Facebook updates about all kinds of fun events. Set your calendars, Comic Fans! March 10th is going to he HUGE! In celebration of Harley Quinn’s 25th Anniversary, this year the bubbly Super-Villain will take over DC’s annual Batman Day celebration on September 30, 2017. Harley Quinn debuted on Batman: The Animated Series in the episode “Joker’s Favor,” which originally aired in September 1992. Co-created by the acclaimed Paul Dini and Bruce Timm, Harley Quinn spawned the now popular and plentiful comic series and is one of the fastest growing characters in DC history, becoming a top ten character in only the last 25 years. 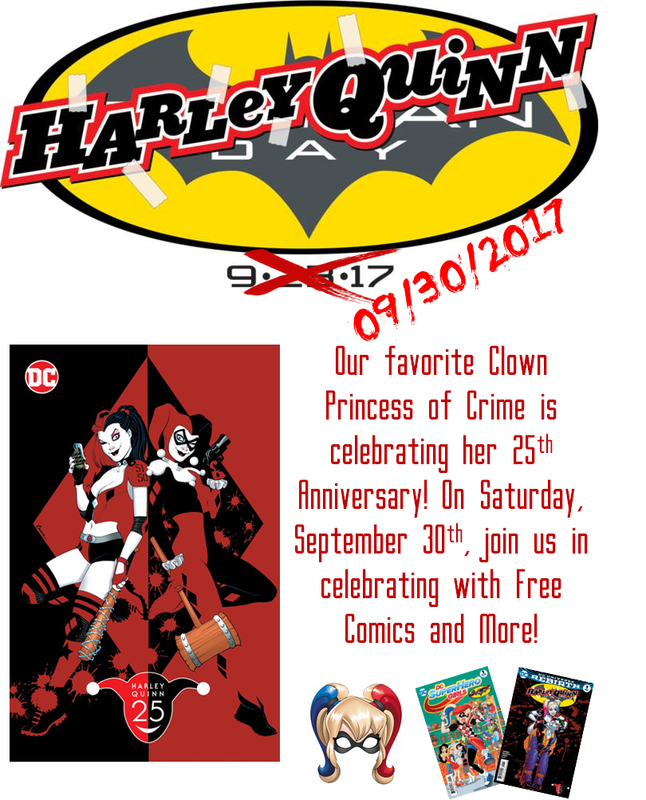 As that Baltimore Comic Con happens the same weekend of the regularly scheduled event, we will be hosting our Harley Quinn Day on Saturday, September 30th!